How NESCAFÉ helps you get the most out of the day, every day? Whatever your passion or project, there’s a NESCAFÉ for you - helping you feel at your best so you can make the most of what you love doing. So here’s what we want you to do – make yourself a nice, fresh cup of NESCAFÉ coffee and get to work. We want to see how you can bring this idea to life by showing us, in an original way, how a cup of NESCAFÉ can be the first step towards getting the most out of a day! 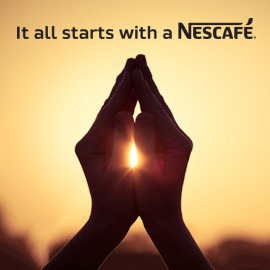 Tell us how NESCAFÉ helps you get the most out of the day, everyday. Get creative and submit your entries by 26 November 2014! Looking forward to seeing your entries!